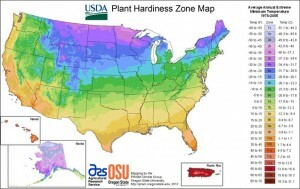 Interactive USDA Hardiness Zones Map. Impressive detail. You’ll need to enter a CAPTCHA, but don’t let that deter you from learning your REAL hardiness zone! I’m a bit of a map enthusiast having worked with some amazing digital cartographers at Penn State for almost a decade. Latitude, longitude, altitude make a big difference in the potentials of your landscape! In fact, I spend a good deal of time each day looking at maps to answer your questions as well as my own. Having spent so many years searching for the best mapping tools, I thought I should just compile what I have found in a list. Sometime, I may sing the lauds of each one individually, but for now, enjoy exploring on your own. Be wary, that some of the webpages look ‘retro.’ Many of these were designed by scientists who have their minds on data, or by plant lovers, who are doing web-coding out of sheer nerve and the desire to share information with folks like YOU! USDA Interactive Hardiness Zone Map. This is awesome. Very detailed from the horse’s mouth, as they say! PlantMaps.com – An international resource of hardiness zone and related maps. BONAP map of the range of Asclepias syriaca, Common Milkweed. USDA – also has plant ecology, classification, cultivation, and cultural heritage of many species. USDA NRCS Web Soil Survey – There’s a learning curve with this one, and it takes time because it is crunching an unbelievable amount of data, but it’s worth the wait if you are interested in the soils around you. It is able to generate custom maps for your soil usage. FAO Soil – an unbelievable resource of global soil data. Great read alot of awesome information! Thanks, Rachel! We try to get quality information out there! locations 9a and 10b. What is native to Brownsville TX. I see it here, So i know it is native. Click one that you’re interested in and you will see a map among the product images. Areas that are bright green indicate that the species is native to your exact county.